Perseverance in Gratitude: A Socio-Rhetorical Commentary on the Epistle to the Hebrews. I’m not certain that I have enough distance yet on the work to be certain in my response, but as I look back from this near vantage point, I would suggest that the following questions were either the most challenging or have the most important implications for the NICNT’s primary audience—the people who have to figure out, and help their parishioners figure out, how to live faithfully in line with the Christian Scriptures. These are all more or less theological issues, but there is far more at stake in how we answer these questions than, say, the historical-critical issue of whether the letter addresses churches in South or North Galatia, or how the visits of Paul to Jerusalem in Galatians line up (or don’t line up) with those in Acts, or how we can use classical rhetorical theory responsibly as a tool for examining early Christian persuasive texts. 5. What does pistis Christou really signify? 4. What are the stoicheia tou kosmou, and what does it mean to be liberated from them? Paul uses a Greek phrase that could refer to “the elements out of which the world is made,” thus, in the science of his period, earth, water, air, and fire. But I hear Paul using the phrase in a figurative sense. I think that he had just given us three examples of the “basic principles that order the social world” in the paragraph preceding his introduction of this phrase—Jew and Greek, slave and free, male and female. Four centuries before Paul wrote Aristotle had used the Greek term sustoicheia to talk about the paired categories into which everything in the world that he experienced fit. These included such things as “right and left,” “odd and even,” “limit and the unlimited,” and (interestingly enough) “male and female.” In most of Aristotle’s pairs, there was a hierarchy. Right is somehow intrinsically superior to left, that which is pure to that which is mixed, and—no surprises here—male to female. I find Paul here taking his converts into the arena of “world construction” and “world legitimation,” as sociologists Peter Berger and Thomas Luckmann would name these processes nineteen hundred years later. In Paul’s declaration, these paired categories are no longer to divide and regulate human interaction among those who are “in Christ.” He draws his audiences’ attention to the extent to which we are held in slavery to socially-constructed lines and values. He calls for an examination and rejection of the ordering principles of the world as “present evil age” to make room for a new ordering of humanity’s common life. Until that is accomplished, we are not experiencing the fullness of the liberation Christ died to bring about. The new wine of the Christian life will not fit into the old wineskins of the life our society has taught us, even groomed us, to live. And the divisions that order our social world, and their associated values and the practices these require of us, just don’t fit in the new creation. 3. What is the role of the Law of Moses in the plan of God and the Christian’s life? Paul addresses in Galatians a cluster of related issues of supreme importance especially for non-Jewish Christians. How can we follow the God whom our scriptures proclaim to have given the Law without ourselves living a Law-observant life? How can (Why should?) we read as sacred scripture—as the collection of authoritative and divine oracles—a bundle of thirty-nine texts that (essentially) assume the covenant framework established with Israel at Sinai as the matrix for God’s interacting with human beings (for blessing or for curse) and human beings’ right interaction with and before God? Paul provides an answer to the first question quite explicitly in the course of his argument, and his answer is stunningly radical. The period of the Law is a great parenthesis in the plan of God between a promise and its fulfillment (though the parenthesis did serve positive purposes related to that plan). What is perhaps more interesting is the manner in which he answers the second question alongside the first. Even in Galatians, where Paul finds himself ranged against the Torah most forcefully on account of the particular situation he addresses, where Paul least recommends the Law in any way that could be construed as a basis for the Reformers’ “third use of the Law,” the Old Covenant Scriptures still (a) reveal and legitimate God’s plan for the redemption of the world; (b) provide the authorization for ceasing to regard its legal prescriptions as binding legislation; and (c) reveal the righteousness that God will bring human beings to attain, if by another means entirely. It leaves me wondering how Marcion could ever have thought Paul to be his ally, let alone his champion. 2. What is the relationship between justification and righteousness? This is the question that’s going to get me in the most trouble, but what can I say? “Here I stand; I can do no other.” I’m also tempted to be more careful here in regard to spoilers—if you’re going to call me heretical, you’re going to have to do it after reading my commentary, not a blog post. I find it interesting and rather telling that the NRSV of Galatians 2:21 reads “if justification comes through the law, then Christ died for nothing,” when the Greek reads dikaiosunē and not dikaiōsis—a word clearly in Paul’s vocabulary—at this point. Most modern translations get this right: “if righteousness comes through the law, then Christ died for nothing.” The implication, I believe, is that righteousness comes through some other means that Christ’s death has made possible. Paul strongly urges his hearers not to turn to the Torah-observant life since “we, by the Spirit and on the basis of trust, await the righteousness for which we hope” (5:5). As I read Galatians, I find that Paul is very interested in how God will bring righteousness to life within us, with the result that we stand justified before him. I take 2:19-20 to be a key passage in this regard, a sort of personal testimony to the winsome results of “seeking to be justified in Christ” (2:17). I seek to give ample room and weight also to Paul’s warnings concerning the ultimate consequences of persisting in giving oneself over to the works of the flesh (5:21) or sowing to the flesh (6:8) and the consequences of giving oneself over to the work of the Spirit or sowing to the Spirit (also 6:8). 1. Why does Paul give so much space to the Holy Spirit in a letter supposedly about justification by faith? I list this as the most important issue for two reasons. First, Paul appeals to the Galatian Christians’ experience of the Holy Spirit as the most decisive factor for his case (“This one thing I want to learn from you,” 3:2). This appeal opens and closes the primary cluster of his arguments in the letter (3:2-5; 4:6-7). Second, the real alternative to the Law of Moses in Paul’s thinking is not faith in Christ, but the Holy Spirit (which those who place their trust in Christ receive). The rival teachers are promoting a life aligned with the Law of Moses as the life that God will approve as righteous; Paul promotes alignment with the Holy Spirit as the God-given means to such an end (5:13-26). In our attention to orthodoxy and orthopraxy, we give far less attention than Paul would have us, I believe, to the numinous dimension of the new life in Christ, the work of the Holy Other who is wholly other. “Paul promotes alignment with the Holy Spirit as the God-given means to such an end (5:13-26).” This sounds like Christians achieve righteousness by following the Spirit’s leading, which is just another human work. Righteousness will always be an eager hope in this life (Gal 5:5). Christians will be raised to righteousness (God would hardly raise those he is saving to any other state). Derek, do you believe that Paul teaches us to cease from any action in hope for righteousness (Gal. 5:5)? No. Our good works have nothing to do with making us righteous either in this life or the next. Christ has set us free from the law to live by the Spirit (Gal 5:1 & 25). Paul believes that God expects changed lives and has given us the divine power and guidance to set us right. This doesn’t make it a human work, though it does require submitting fully to God’s work in us — till it’s no longer me living, but Christ living in me. Read the commentary, Derek; then make judgments. From Gal 2:20, Christ already lives in Christians. We are already new creations (Gal 6:15). The flesh will continue sinning until the day we die and those who have not been crucified with Christ (Gal 2:19) will not see the Kingdom of God (Gal 5:21). God knows that we cannot lead changed lives or he would not have sent Christ into the world (implied by Gal 2:21). One of the fruits of the Spirit is self-control (Gal 5:23), which is about resisting the sins of the flesh (vs 24), not making us righteous before God. 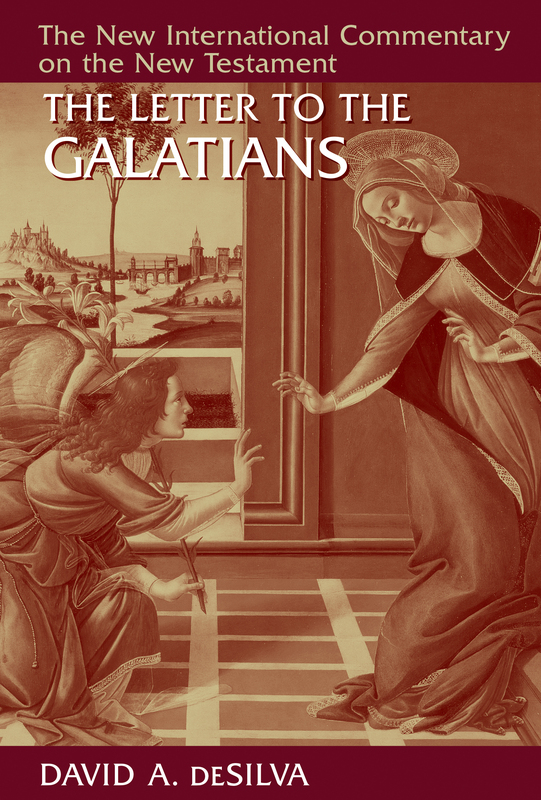 There are so many commentaries on Galatians, but then, it is an important letter. I already have a dozen, but I’ll have a look at yours Dr deSilva. Thank you Dr. DeSilva, I really appreciate your careful and refreshing approach to the letter. Can’t wait to get my hands on this volume!